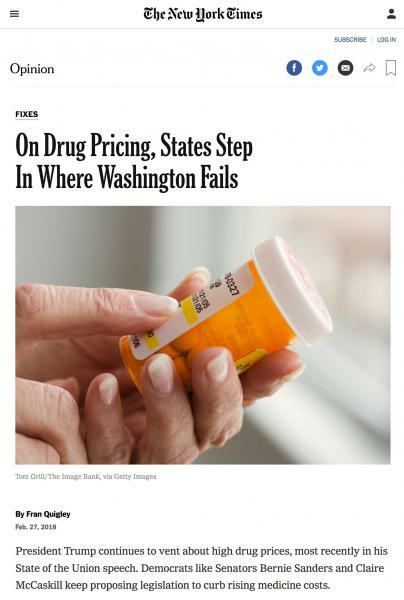 PFAM's coordinator Fran Quigley published a column in today's New York Times about the exciting momentum for drug price reform in many U.S. states. You can read the article here. President Trump continues to vent about high drug prices, most recently in his State of the Union speech. Democrats like Senators Bernie Sanders and Claire McCaskill keep proposing legislation to curb rising medicine costs. But these pronouncements may not be worrying drug companies too much. They can see that for all of his bluster, the president has not embraced any significant reforms, and that Democrats don’t get much support on anything from the Republicans who control Congress.